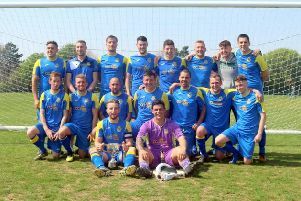 Chichester City are hoping a touch of Juventus magic will inspire them to success. They have had a visit from Aldo Dolcetti, who is on the first-team coaching staff with the Italian giants. And he even noted down details of one of their training sessions. Dolcetti’s son Lorenzo has played for the SCFL premier-division side since coming over to study at the University of Chichester. Midfielder Lorenzo has also had a spell at Bognor. His dad used the current international break to fly over and visit his son – and of course, he couldn’t resist getting involved in some football activity while here. Chi City first-team coach Danny Potter said: “Aldo’s visits to Chichester have been to see Lorenzo, and he’s also been linking up with Lorenzo’s staff at University of Chichester. “I have met Aldo a number of times now and been fortunate to visit him in Italy too. “He visited us last week as it was Lorenzo’s birthday and it was the international break. He had a few days free, so stayed in Chichester for a few nights. He joined us at training and got involved playing. “He trained for the whole session, which I coached, and he told me how much he enjoyed it. I also saw him write down my session plan! “He was brilliant with our players and he really did set a high work-rate in training, which our players copied. “Lorenzo is passionate about following his dad’s footsteps in coaching and is studying a coaching degree here. Dolcetti’s involvement didn’t rub off immediately – City slipped to their first league game of the season on Saturday, going down 2-1 at home to Eastbourne Town, although Connor Cody’s bicycle-kick goal would not have looked out of place in Turin being scored by Juve’s star man Cristiano Ronaldo. But perhaps some of his influence was felt as they battled to a Peter Bentley Cup 6-5 penalty shootout win at the end of a 0-0 draw at Pagham on Tuesday night. City keeper Jordan Matthews was the hero of the night at Nyetimber Lane with his shoot-out save. The match officials made an already-dour cup tie worse with a series of breaks in play that spoilt the match as a spectacle. Take nothing away from Chichester City, though: they showed why they are doing well – and they should have wrapped the game up long before the final whistle. Pagham were grateful for yet another masterful display by keeper James Binfield. The Lions started well but countless free-kicks left both benches unhappy. City’s Kieran Hartley and Kaleem Haitham were a handful, with Pagham’s back line not given any peace. After a goalless 90 minutes, City were awarded an extra-time spot-kick but Tiago Andrade’s shot sailed over. In the shootout, both sides’ first five spot-kicks were scored and Haitham put City 6-5 up. Ryan Cox stepped up for Pagham but Matthews got down to it, triggering mass celebrations from City. Chi go to AFC Uckfield in the league on Saturday looking to protect top spot but have no game next Tuesday, which – training commitments not withstanding – means they will be able to keep an eye on how Dolcetti senior fares with Juventus in a Champions League visit to Old Trafford.